Los Cabos is not only home to distinct mountain and desert terrians, but it is surrounded by both the Sea of Cortez and the Pacific Ocean. This ecological diversity accounts for why so many travelers and locals alike like take part in outdoor activities. Sportfishing and golf are probably the most popular pursuits, but Cabo San Lucas, San José del Cabo, and the surrounding area also offer world-class conditions for adventures as wide-ranging as snorkeling, kiteboarding, zip-lining and off-road racing. For beachgoers, Playa El Médano and Médano Beach are two mandatory stops in Cabo San Lucas. But, Médano Beach attracts a large number of people who want to be part of water sports activities. Snorkeling in Cabo San Lucas is recommended for those who have to get out to Lover’s Beach near Land’s End. You can also be part of fishing, golfing, diving, and many other such activities. FLYBOARDING – One of the most popular water-based activities in Cabo San Lucas is flyboarding. In this activity, a pair of boots is attached to a board which is further linked to a wave runner or jet ski. The jet ski then sends water pressure and allows the flyboarder to propel up to 35 feet out of the water. Once out of the water and flying above, all the tricks and turns are possible. As you fly above Cabo San Lucas Bay, it will give you the feeling of free flight. SNORKELING – Slip on your snorkel and jump in for an unforgettable ocean expedition. Under the guidance of an expert, marvel at the highlights of Cabo San Lucas both above and below the water. The water is so clear that one can easily spot myriad of marine life and marine vegetation. Santa Maria Bay is one of the three best places to snorkel in Cabo San Lucas. Moe is a type of fish you will see while snorkeling in Cabo San Lucas. SCUBA DIVING – The sea of Cortez is home to a large variety of fish and dive sites which are popular worldwide. Under the guidance of certified scuba instructors and dive masters look forward to diving that is sure to take you to the most pristine of destinations filled with exotic flora, fauna and amazing rock formations filled with a sea of tropical fish. From coral reefs to schools of exotic fish – there is much more to watch. Even whale watching from the water is possible! CANYON CANOPY TOUR – Amongst an array of eco-excursions and outdoor adventures in Cabo San Lucas, zip-lining through a UNESCO protected biosphere is also considered a must see while in this vacation paradise. The longest line here stretches over 4000 feet and allows visitors to race hundreds of feet above the canyon floor at speeds approaching 60 miles an hour. In addition to zip lining, you can also be part of rock climbing, rappelling, Tarzan swing, and walking over the commando bridges. EXPLORE PLAYA DEL ARMOR – Lover’s and Divorce Beaches are as close as you can get to Land’s End without a boat. However, you need to snorkel or take any other mode of water transportation to access both of them. Lover’s Beach is on the Sea of Cortés side, and generally has safe swimming and good snorkeling conditions. It also features spectacular views of the bay. Walk through a gap in the rocks and you’re on Divorce Beach. GO GOLFING – There are several world-class golf courses along the coast of Los Cabos. All have beautiful views of the Sea of Cortez and surrounding mountains. However, “The Great White Shark” and “The Golden Bear” are the most popular courses. Ideal for players of all abilities, the gold course offers a perfect blend of desert-style, shot-making challenges and stunning views. The golfers can also take in the mesmerizing views of the magnificent lush green surrounding scenery. In the present time, Cabo San Lucas is the perfect destination to be part of these outdoor activities, to unwind, relax on stunning beaches along the Pacific Ocean, or party until the wee hours of the morning in the city’s iconic nightlife scene. 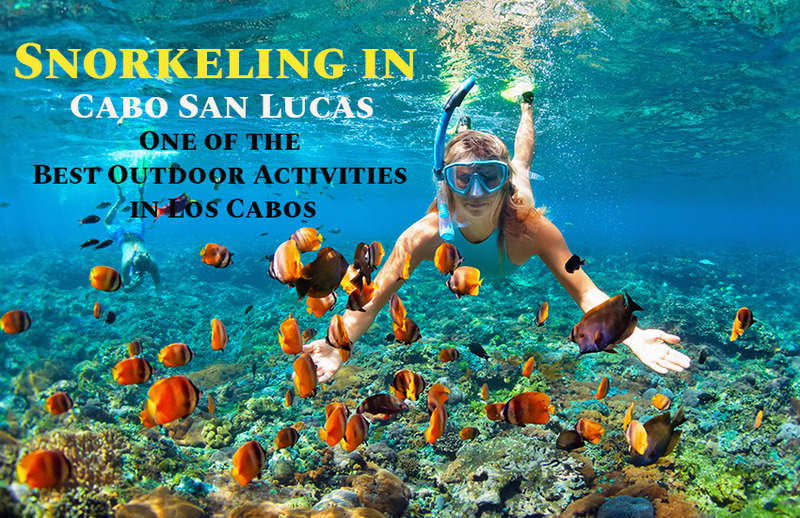 Regardless if you are planning to visit on honeymoon or celebrate an anniversary or birthday or plain fun, do not miss out these outdoor activities along with snorkeling in Cabo San Lucas to explore the rich marine biodiversity of the region.